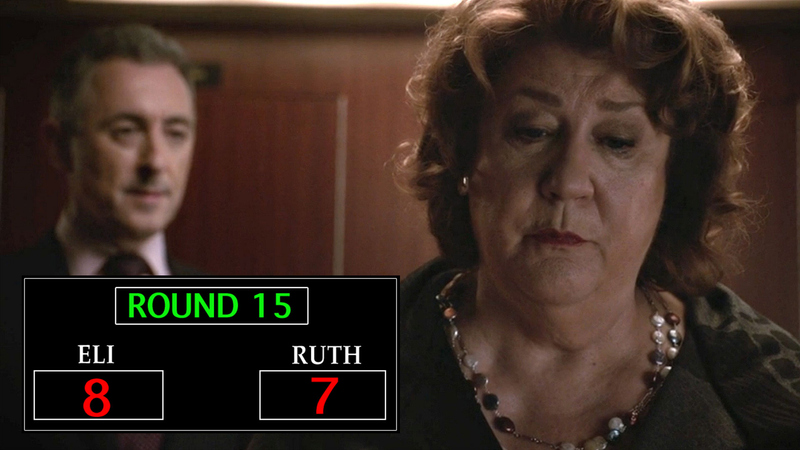 Why: In a bold move, Ruth pushes the campaign to do the "Full Grassley" in order to make the nightly news and, hopefully, make a strong showing in the Iowa Caucuses. While the Florrick bus did reach all 99 counties in the state, Peter won a mere 4—far behind the front runners. Eli Gold: You overreached. You sweet talked Peter, convinced him that he could win the presidency. You attacked the frontrunner and ended up alienating voters. Ruth Eastman: I don't need the Monday morning quarterbacking, Eli. I did exactly as you would have: follow the polling data. Eli: For any other candidate? Yes. But not this one. You were with him 24/7 for months and you missed the most fundamental thing about the man. Peter Florrick is not number one, not nationally. She is. Ruth: Yes, Eli, we all know Hillary Rodham Clinton is a giant. Eli: No, not Hillary. Alicia.